Thank you so much to everyone who came out for Harvest Fest this weekend! After a morning of setting up in the rain, the sun came out just in time for the festival to begin. Kids of all ages eagerly gobbled up multiple helpings of popcorn and caramel apples, while families gathered to connect at the first all-school event of the year. A1 students sold homemade candles, pumpkins, gourds, maple syrup and crafts. The bluegrass band, put together by Clayton Shanilec, put the "fest" in Harvest Fest, and this event proved you can never have too many bouncy houses! Harvest Fest would not have been possible without the generous support of Great River Families who donated for and volunteered at the event. Andrew Palahniuk and Mary Pumphrey arrived at 9am on Harvest Fest day and used 2 stoves and 4 giant pots to create the soup broth, tending to it for more than 3 hours (even though they had signed up for 2 hour shifts). Nicole Palahniuk arrived later but stuck it out through the second batch of soup, while everyone outside was already enjoying the festivities. Asako Hirabayashi signed up for an hour of face painting but gave 3 hours of her time without a break because she didn’t want to disappoint the long line of excited kids. Katie Cashel, who facilitated the bread and fruit donations from the Hallie Q. Brown Food Shelf, lobbied for every last loaf of bread to find its way home with a family. Our setup and cleanup teams were amazing, stayed until the bitter end, and brought some serious muscle to the table to boot! Some of my most valiant and eager helpers came in a small size; the first to arrive and jump in were Rowann, Piper, and Turi Coburn. They couldn’t have been more excited to be a part of things. Each time they would finish a task they would eagerly ask, “what’s next? What’s next?” I admit I hadn’t anticipated the aspect of volunteer coordination that involved having jobs ready for all ages. But I should have expected no less from a Montessori school! My trusty team sturdied poles to help move a 10x20 tent from the hill to the parking lot. I would have thought we needed only adults to pull this off. They quickly opened my mind! I want to thank Clayton Shanilec and his wonderful band, who gave the event the joyous atmosphere it deserved. And Scott Brown, CPA with the Anton Group, who generously sponsored the band. Heather Thomas, a longstanding member of the Parent Engagement Group, helped with much of the planning and made it possible to have the games, popcorn and photo booth. Judging from all the photos I'd say it was a hit! Thank you so much to all the volunteers who gave food, supplies, time, energy, sweat and more. You guys are the heart and soul of our community and we thank you! See the full Harvest Fest photo album HERE. Our next all-school event is the Conferences and the Conference Potluck, coming up on November 16-17. The Potluck is all about teacher appreciation!! If you want to show some support for GRS teachers, please join us in this effort. Sign up here to volunteer or donate toward teachers' meals! The Parent Engagement Group (PEG) 6th Grade Bridge Program ambassadors, Cynthia Putz-Yang and Erin Westenberg, hosted a S’mores outing for the new 6th Grade students and their families on September 17. We had great weather, a roaring fire, lots of s’mores, and the kids got to spend some time together outside of the classroom. All of the 6th grade bridge students are new to Great River this year, but you wouldn’t have guessed this if you were an outside observer. Games of Frisbee, football, running around, and a lot of laughter made it look like this group has been together a lot longer! It’s so heartwarming to see them building community already. The parents and families were also invited, and we definitely took advantage of this time to get to know each other and share our experiences from the first few weeks of school. A few of us are GRS veterans because we have other children at school, but many families are new this year. And I must say they are a great addition! 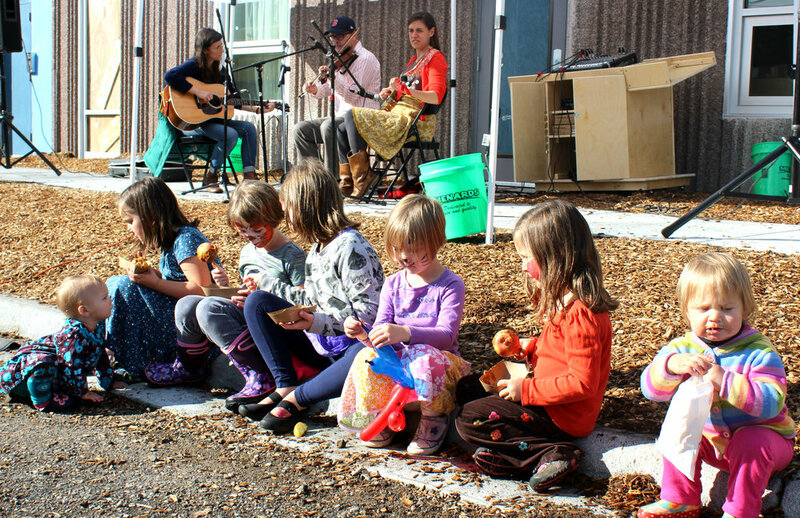 A true testament that expanding our school can be a positive for our community. If your level has not had a social yet, stay tuned. Your PEG ambassadors are likely in the planning stages right now! A1 Families had the opportunity to get acquainted over dessert on August 15th at PEG's first A1 Social of the school year! There was a good turnout of students and parents at Newell Park in Saint Paul - and finally, no rain! PEG A1 Ambassadors Heather Thomas & Etta Dreher presented information, fielded questions and showed examples of A1 student gear. Specifically, they showed parents the 3" zippered binder and a mess kit, two necessary pieces of equipment for trips. The students played games and did a few ice breakers on their own. The next A1 Social will be during the Odyssey on September 12th, 7-9pm at Half Time Rec in Saint Paul.